DownWithTyranny! : Would Sebastian Gorka-- AKA #FakeTerrorismExpert-- Be Able To See The White House Psychiatrist If Ted Lieu's Bill Passes? Would Sebastian Gorka-- AKA #FakeTerrorismExpert-- Be Able To See The White House Psychiatrist If Ted Lieu's Bill Passes? I'm sure there will be endless debates about who is the worst of the worst in Trump's nasty little proto-fascist kleptocracy. 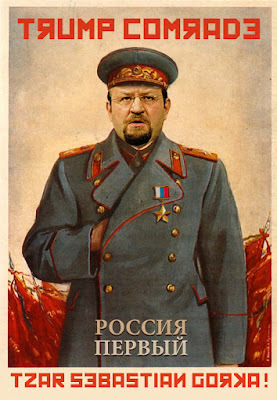 There's Bannon, of course, who would be the hands down early fave, but let's not forget Stephen Miller, Betsy DeVos, Wilbur Ross, Tom Price, Scott Pruitt... and, yes... there's also the Hungarian neo-Nazi, Sebastian Gorka, who we took at look at last week. And we're not the only ones looking closely at the neo-Nazi from... well, no one really knows when he was born or where he was born but people who know him swear he's an earthling who once served as a British spy and, later, as a professional fascist in his ancestral home, Hungary. Eventually he married an unfortunate-looking somewhat older American heiress-- like him, a psychotic islamophobe and hate-monger-- and managed to acquire U.S. citizenship that way. They were both Breitbart bloggers who help Bannon drive Trump further and further from mainstream thought on national security issues. Anyway, most people who know anything about him claim Gorka is certifiably insane. You'll probably come to the same conclusion by listening to the taped phone conversation (on the 2 YouTubes above) that he had with Republican South Carolina counterterrorism expert Michael Smith. Gorka doesn't like Smith's twitter feed and phoned him up to threaten him with a lawsuit. Listen as Smith, tapping the call after the first 5 minutes, draws him out; it's funny-- or chilling, depending on your perspective. At first Smith, who has been outspoken about Gorka's obvious lack of competence for his job, thought it was a prank call. Smith, who says he voted for Trump says he was "stunned that the administration would hire him to work in the White House on such critical issues as counterterrorism. This could blow up in our faces, to have basically an amateur working on such important policies and working with people like Steve Bannon." You'll notice if you listen to the taped call that Gorka invited Smith-- over and over and over-- to meet him at the White House. The day after the call, though, he withdrew the invitation. "Given your statements for the latest attack piece and continued disparaging Tweets against not only myself but the administration and president, consider your invitation to meet withdrawn." Newsweek picked up on the story last week. ...[Q]uestions about Gorka’s views and credentials to speak authoritatively on Islam and terrorism were severely criticized in lengthy feature articles in the Washington Post and Wall Street Journal in recent days. He also received a wave of unfavorable publicity in January 2016 when he was arrested for trying to pass through a TSA checkpoint at Reagan National Airport in Washington, D.C. carrying a loaded handgun. He was charged with a misdemeanor and sentenced to six months probation. “He thinks the government and intelligence agencies don’t know anything about radicalization, but the government knows a lot and thinks he’s nuts,” Storer was quoted as saying in the Post. Nor has Gorka-- who does not speak Arabic and has never lived in a Muslim-majority nation, according to news accounts-- submitted any of his articles for review in scholarly journals, says Lawrence P. Rubin, associate editor of Terrorism and Political Violence, the leading journal in that field. Profound ignorance plus irrational hatred melded with extreme malignant narcissism. sounds like every single nun and priest I was burdened with as a child in cat'lick schools. And, natch, every dedicated Nazi ever. Add ambition and opportunity... and you have the American hitler. One can make the case that the top personnel of the Third Reich were insane. They still caused an incredible amount of death and destruction. It will be thus with the Trumpenproletariat. What we now have in this nation is the melding of the Corporatist Coup, the OSS, and Operation Paperclip-like "rehabilitation" of anti-Communist ideologues. So much of the Nazi regime was restored to power either in Germany or in the US that there can be no doubt that the offspring of the original plotters are now attempting to solidify the efforts of several decades. This is what they were after in 1934. No thanks to the Clintonite Democrats for facilitating fascism by allowing ambition to overrule reality.